I’m well aware that the claim of “most important conference” is a big one. If I didn’t feel that was true, though, I’d have never said it. Big Omaha is, in a few words, what would happen if TED were in the business of technology conferences. Big thoughts, huge calls to action and absolutely zero crap. In a world of bubble rumors, huge egos and even bigger failures, Omaha, Nebraska holds the conference that is the antithesis to all of these things. Let’s take a look at a bit of history. A few years ago, organizers Jeff Slobotski and Dusty Davidson were given the challenge to take the spirit of entrepreneurship in Omaha and gather it into one motivating place. Taking that challenge to heart in 2008, Big Omaha was born. World-class speakers come to the stage to talk about ideas, opportunity and what drives them. While that’s not entirely different from what we’ve seen at other conferences, it’s what happens off the stage that truly sets Big Omaha apart. Tech conferences are typically driven to the direction of startup rallys, competitions and amazing parties to cap off each day. There’s nothing at all wrong with that focus — heck our own TNW conference follows that same model, and people can’t wait for it to come around every year — but Big Omaha breeds a different sort of feeling. If you’ve ever attended a WordCamp, you’ll get the idea. Except you have to add to the mix the fact of having international speakers mingling with the local crowd. You’re also not traveling and picking from session to session. Big Omaha is laid out clearly, in a single large room, with ample spaces to sit and carry on conversations. I think that this is probably the most striking thing about Big Omaha. Wandering the floor, you’re just as likely to see Gary Vaynerchuk sitting on the floor talking to a startup founder as you are to overhear people discussing the ideas that were just presented on the stage. It’s networking, with a focus on creating and inspiring you to do more and higher quality work. Mr. Wright states it in the way that I have struggled to do for the past two days. While it’s common to walk away from an event with that “conference high”, this is the first time that I have seen people start to take action before walking out of the doors on the closing day. Plans were being made, calls were held, emails exchanged. The ideas that were given wings on the stage were given wind in which to fly from the audience. Though, aside from the stage, nothing about Big Omaha feels like the audience is any less a part of the picture. You can expect random dancing, instructions to move an entire row of chairs from the back of the room to the front and more standing ovations than you’ve ever seen in one place. Expect to be surprised and driven by some unseen force to make plans to attend the following year even before the current one is over. I was given the opportunity to come to Omaha to find out what’s going on in “Silicon Prairie”. After the first day I was convinced that Omaha is something special (more on that during my massive weekend post about why you need to know about Omaha). After the first hour of the Big Omaha conference, I was convinced and had already made my decision to return the following year. Even if I’m not invited back as press, I’ll buy my own ticket, and pay my own way. 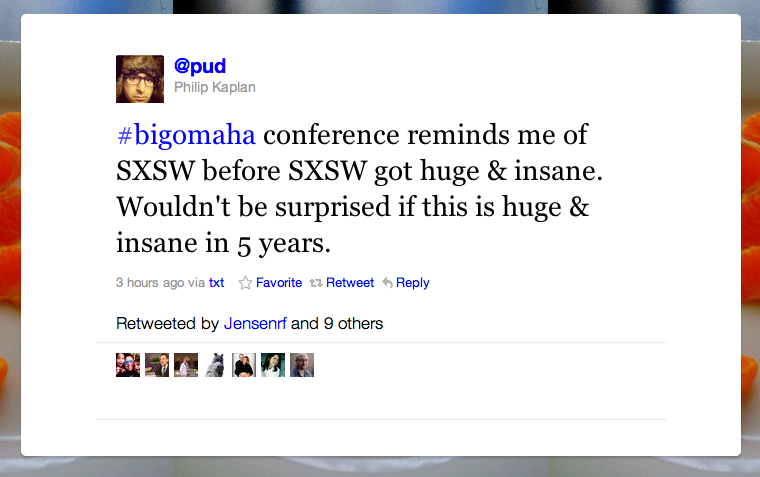 Outside of The Next Web Conference, Big Omaha is the single most important plan that you’ll make for 2012. But move fast. This year’s conference sold out in 3 days, with a waiting list of over 600 begging for standing room tickets.